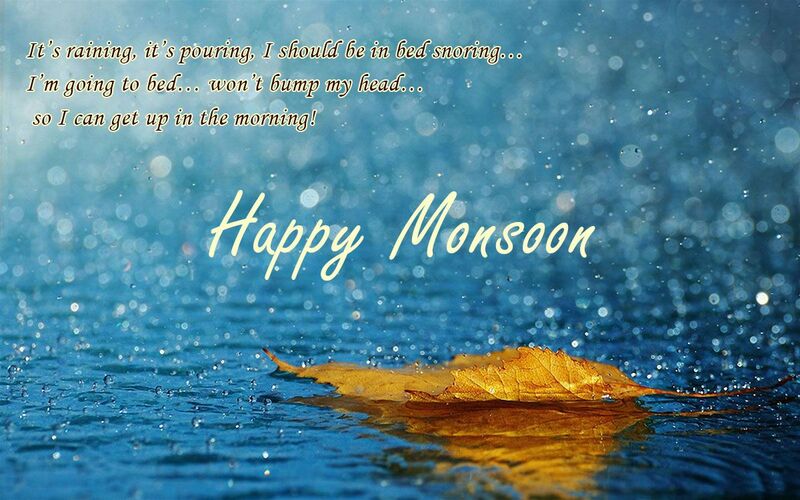 Happy rainy season to all my dear friends. Some feels the Rain, Others just get Wet. The sound of rain is my lullaby. Rainy Season is the day Which can show the love.. I feel you around me, whenever it rains. It’s raining, It’s pouring. Facebook is boring. I love falling asleep in the sound of rain. It may be stormy now, but it can’t rain forever. Like the rain, I have fallen for you. Love and marriage are like walking in the rain together. then the rain starts pouring. the smell of rain, or the feeling of forever. see you standing in the rain..
in case it doesn’t rain. You Lose Sometimes It Rains. The nicest thing about the rain is that it always stops. but a hug makes it wonderful. that’s what I wish for. Rainy Season is the day which can show the love. This rain makes me miss you even more. When I seen the Rain you are first come in my Mind..
You Lose Sometimes It Monsoon....! and the smell!..RAINY DAYS make me HAPPY!!! Most romantic season, love rainy season a lot. Whenever it rains, I feel you. Nice blanket = Perfect sleep. its the LOVE of SKY to the EARTH. learn to dance in the rain. but sometimes, rain gives you delight. Monsson Make the love more Romantic..!! so no one can see me crying. Barish is a wonderfull opportunity. but to get true love you have to go through the pain. but there are always signs before it completely falls.. Enjoying rain with a cup of tea. Miss you and kiss you, enjoying rain. Look at my DP, its rainy season, enjoy it. I love it when it Rains. Dear Sun, I know your up there hiding behind the clouds. Hide and seek is over, let’s have some sun! so I can get up in the morning! Tarha Aap Ki Zindagi Hamesha Mehakti Rahe. Par aaj yahan toofan aayega..!! Iss Barish Ki Har Bund. Mitti Par Girne Se Uthne Wali Khushbu Ki,. ★tarha Aap Sab Ki Zindagi Hamesha Mehakti Rahe. Her boond tere dil se her ek ghum ko mita de..!! aise me kaise jaoge, barsat thodi bahot he. kagaz ki kashti or barish ka zamana hain..! !